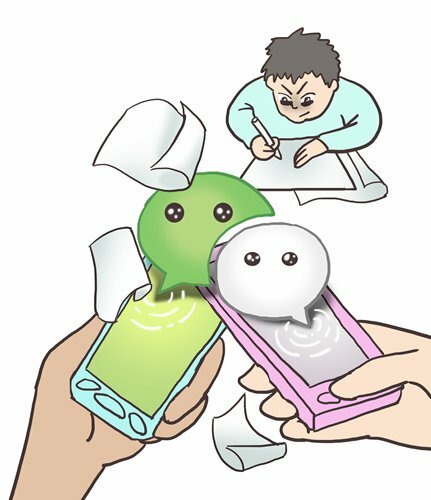 WeChat parent groups are online gatherings of Chinese parents of students from the same class, which are usually organized by their class teacher. The teachers are also the group leaders. The basic function of their group is to use technology to enhance communications between school and family. In reality, however, these groups are simply a means for teachers to inform parents to "do as you are told!" They are not channels for parents to file complaints or challenge decisions. Teachers keep an authoritative front against parents just as they do with students. So it is not uncommon to see parents simply reply "received and thanks" once a notice is released by the teacher. Harmony in these groups only exist when parents are as obedient as kids. Otherwise conflicts occur and war can break out. I once was in a short-lived group which survived for only several hours. That group was set up by my daughter's teacher after she entered the ninth grade, three years ago. The ninth grade is the second-most important grade in the Chinese educational system after grade 12. You see, twelfth graders face China's national college entrance exams (gaokao) while 9th graders have to compete for a spot in senior high school, as not all junior middle school students are granted a quota in high school, given China's large population and limited resources. It is understandable that parents are even more anxious and nervous than students of those grades. Thus, as soon as this 9th-grade WeChat group was established, long queues of questions were raised by concerned fathers and mothers. Nobody took her seriously, either, when that young female teacher stated that "this is a group I made only for school and grade announcements. Do not ask irrelevant questions to distract attention." That teacher dismissed the whole group after two warnings, leaving us parents dumbfounded. Back in the classroom, the teacher directed her anger and dissatisfaction toward her students, criticizing their parents as rude and impolite. This is just one such case of teachers and parents facing off on WeChat. Most recently, a battle between an angry father and his daughter's teacher went viral. "Are you in bed now, teacher?" a father asked the teacher at midnight. "Yes?" the teacher replied. "You are in bed while my daughter is still doing her homework. You can't go to bed so early! How can you assign them so much homework that keeps them up so late, while going to bed earlier than them?" the father continued. "Well said; my daughter is also still up doing homework," another parent chimed in. Minutes later, the teacher announced that the father had been removed from the group, then asked whether any other parents wanted to "quit" the group. Screen shots of this discussion quickly went viral online, and you can imagine how many supporters the father had for his candor while the teacher was heavily criticized for her bad attitude and censorship. There were other voices who pointed out the root of such tension between Chinese parents and their children's teachers. The problem doesn't fall entirely on the teacher, because she is just one link in a long chain of problems in China's educational system. They are simply fulfilling their obligation of requiring students to finish their homework on time. Some homework is so hard that even some parents fail to solve it, so there must be something wrong with the textbook or supplementary materials that has made such tasks too hard and time-consuming for students. I feel lucky that my daughter was born before competition in Chinese schools became so fierce. And yet, I have new concerns. If no real action is taken, what sorts of difficulties and problems will my grandchild's generation face when they become students?